GoCD provides a section on the stage details page to view the GoCD configuration xml used when executing a particular instance of the stage. 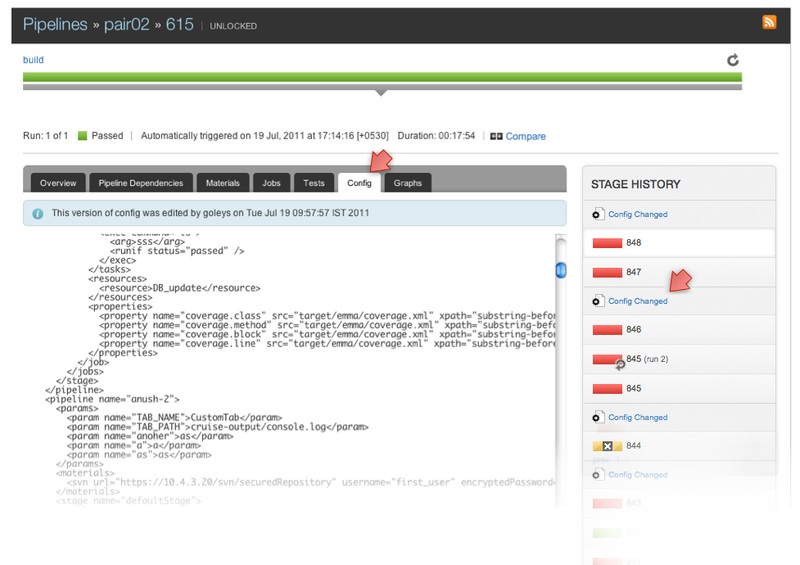 Admin users can use this view to trace a pipeline run back to it’s configuration. The stage history widget which can be found on the right hand side of the stage details page has markers to indicate GoCD configuration changes. These markers are visible to all users. Click on the tab ‘Config’. Choose the stage instance from the stage history widget on the right. Note: This tab is available to admin users only. As mentioned in the previous section, the stage history widget has markers to show if configuration has changed between two stage runs. For admin users, who have the permission to view the configuration xml, the markers appear as links. Clicking on these links shows the exact difference between the configurations. The changes are shown in the same format as that of “Git Diff”.